Well, another award show is in the books. 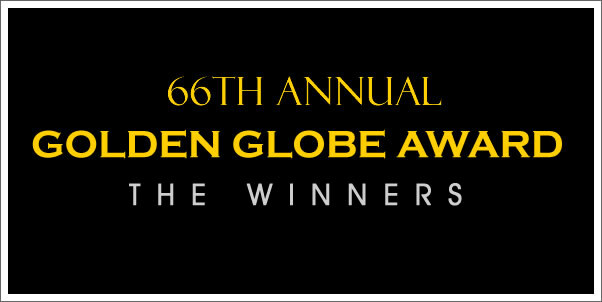 The 66th Golden Globe Awards has come to a fairly non-surprising close. SLUMDOG MILLIONAIRE picked up another 4 awards to add to the handful it won at the Critics Choice Awards last Thursday. Among them was composer A.R. Rahman who delivered the score for the film. Having seen Slumdog a couple of times, it is certainly a feel-good hit and it is nice to see such an comparatively obscure film get recognized. It still isn't the best film of the year though. My personal opinion aside, it wasn't much of a surprise to see it pick up as many awards as it did. The film has been steadily picking up momentum over the last couple of months...and will likely have even more now going into the Oscars. It was great to see Kate Winslet pick up 2 Golden Globes for her performances in REVOLUTIONARY ROAD and THE READER (both of whom's score left a lot to be desired). Still, her performances were perfect and most deserving and her sincerity and graciousness on stage is really refreshing. I would not have not been upset to see Meryl Streep win for Best Actress either. I did hope that Thomas Newman and Peter Gabriel would nab best song for WALL*E, but that went again to Bruce Springsteen for "The Wrestler" as it did at the Critics Choice Awards. Speaking of THE WRESTLER, Mickey Rourke's acceptance speech for Best Actor in a Drama was one of the more surprising moments...with his "dog thanking" and being flipped the bird by director Aronovsky. Below are the full results from the show, ordered in a soundtrack-friendly way.